Smoke was emerging from a stack at a thermal plant at North Korea's Yongbyon nuclear research center, weeks before Pyongyang demolished its nuclear test test at a different location. 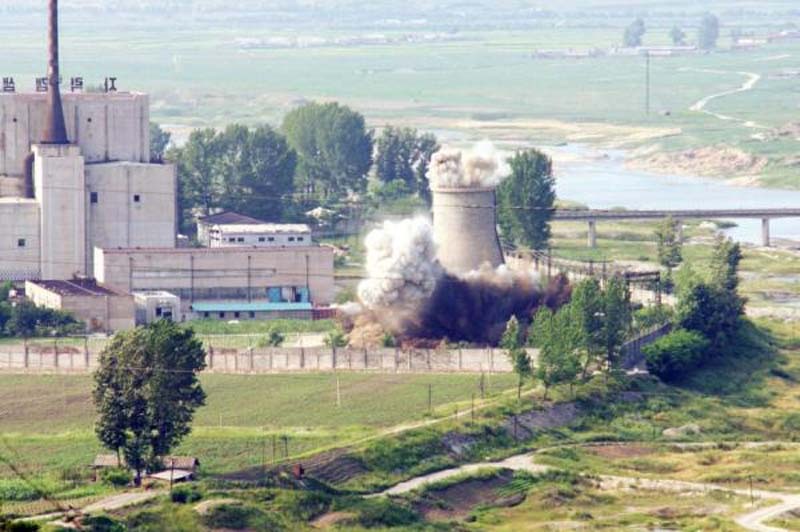 According to U.S. analysts with 38 North, the "light smoke" on May 6 was coming from the Radiochemical Laboratory Thermal Plant at Yongbyon. "Additionally, coal bins had been partially filled and groomed since April 17," Frank V. Pabian, Joseph S. Bermudez Jr. and Jack Liu write. These are signs that have previously indicated initial North Korean preparations for a reprocessing campaign, according to the analysis, but the absence of specialized rail cars for radioactive waste transfer may indicate otherwise. North Korea has also built a new "small structure" about 40 meters north of the complex's cooling tower, which was first observed on imagery dated April 17. Other structures were seen at the site, the analysts said, including a "new upper cooling-water pump house" that "appears externally complete, with a new blue roof installed." "Additionally, new dredging operations are underway, changing the configuration of the earthen water diversion dams downstream in the Kuryong River. The purpose of this activity is still unclear," they write. What is clear is evidence North Korea continues to invest in Yongbyon. At the Experimental Light Water Reactor a new engineering office that stands four stories high could be seen, in addition to "two single-story buildings" built between October and April. Experts are divided over whether North Korea's most significant action last week, the dismantlement of the Punggye-ri test site, is a positive development. Siegfried Hecker, a senior fellow at the Center for International Security and Cooperation at Stanford University, said the move is "an important step in the direction of denuclearization." Others, like Taro O, adjunct fellow at the Pacific Forum, said the demolition is trying to appear as if a major concession was offered. "But it's not," O said, according to The Korea Times.